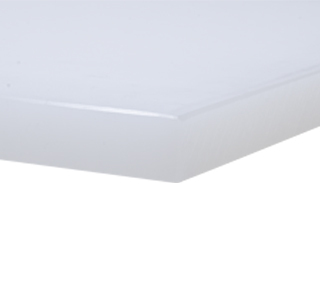 White Polyethylene plastic, soft-touch surface; a very practical cutting surface for professionals. It is important to turn over the board daily and use each side in order to prevent warping. Please always wash with luke warm water. Never wash with hot water to avoid warping of material. Exposure to extreme heat, boiling water and sterilizers may cause warping or softening. Use bleach (approx. 20 minutes) to remove stubborn stains. Make sure to wash thoroughly afterward. We recommend flipping the board from time to time to allow for even wear. Wooden cutting boards are currently banned by the NYC health department, therefore KORIN highly advises users to take sanitary precautions by considering cutting board materials.